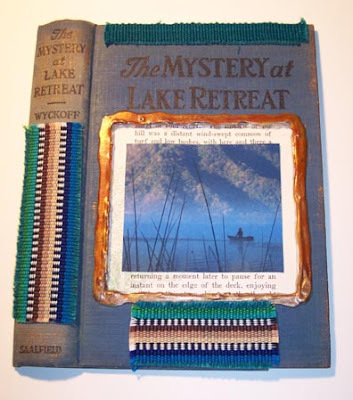 Like all altered book projects, there are really no rules that must be followed. However, there are a few things that will make your life easier if you want to make one of these! The first tip is to use a box cutter to make the holes for your image or images. Make sure you’ve got a sharp new blade - book covers take some work to get through, and you’re much more likely to have skipping (and cuts!) if your blade is dull. I used clear silicone caulk and Elmer’s carpenter’s glue to create a “frame” around the cut out. When they are thoroughly dry, they both accept acrylic paint quite well. I also used the carpenter’s glue to attach the fabric to the one cover. 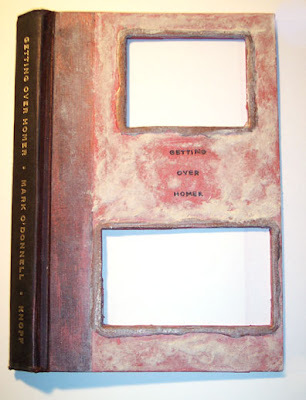 I used acrylic paints on both covers, and added some texturizing media to the Homer cover before painting. If the cover is shiny, prime, sand, or gesso it. Otherwise, not really necessary. All the compounds work fine, adhere well, and do not flake off over time. Caulk and heavy acrylic medium are probably the most flexible. Additional texture things like sand and stones can be mixed into all the compounds. Other adhesives like Gorilla Glue and E6000 can be used to adhere heavy things to the cover and they hold up well. Spraying with a sealer is optional, but probably a good idea. Favorites are Krylon acrylic or varnish.